CLEVELAND — Just like the tracks Patrick Warner lays down in the recording studio that still need a beat to make a finished song, Warner says he's needed a little help in his 22 years. "I mean, to be 100 percent honest, I don't know if I'd be alive," said Warner. Patrick Warner reads lyrics off his phone in a recording studio in the back of Refresh Collective's Fresh Lab in Detroit Shoreway. Maurice Philpott goes by his artist name, "Los P." and grew up near Warner. "The statistics say I'd be dead or in jail," said Los. "So yeah, it's that deep." Maurice "Los P." Philpott sits in front of the Fresh Lab shirt press in Detroit Shoreway. Both say violence and drugs threaten their east side neighborhoods all the time. But music can be a way out. "At first, it was just a hobby and then I had a lot of family issues going on and it went from being a hobby to being very therapeutic for me," said Warner. Dee Jay Doc, Warner, and Los listen back to tracks in the recording studio in the back of the Fresh Lab. That's where Dee Jay Doc Harrill and his nonprofit, Refresh Collective, comes in. The group helps students like Warner and Los build on their raw passion, which creates a sense of pride in the neighborhoods they come from. Dee Jay Doc gives Los a denim vest to try on from the selection at the front of the Fresh Lab. "A lot of times other people drive by and think, 'I don't know about that neighborhood. I don't there there's anything there for me," said Harrill. "So it's our job to promote the fresh, promote what's healthy." Fresh Camp teaches students how to write a song and perform. Fresh Force teaches students about running a business through the group's clothing line. The newly-opened Fresh Lab combines the two, selling shirts in the front of the shop with a recording studio in the back. Dee Jay Doc, Los, and Warner talk in the Fresh Lab behind some of the clothing on display. 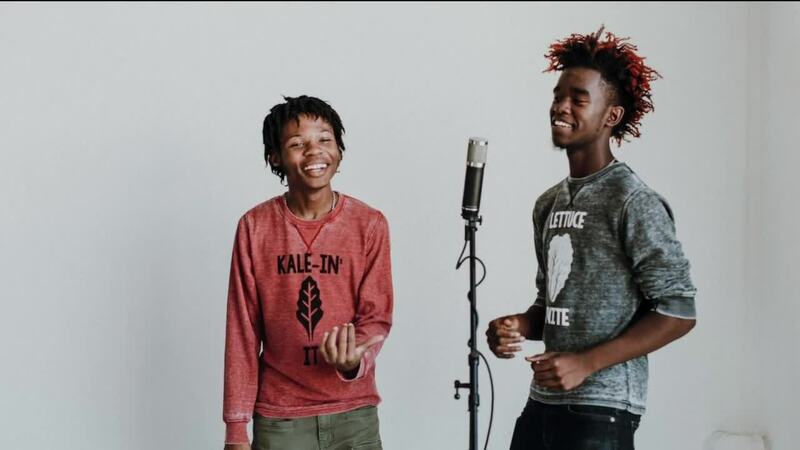 Recording music and modeling the clothing line has helped Los P. reach out to youngsters in his Buckeye neighborhood, setting a good example. "It's challenging because it's not always accepted and people don't always like change," said Los P.
Los helps model some of the Fresh Force merchandise, wearing a gray pullover. He and Warner are also giving back through the collective as counselors at the Fresh Camps over the summer. Warner says he mentors soft-spoken kids with something to say through music like the one he used to be. "If they want to get something off their chest, then I just try to support them in any way that I can," said Warner. Warner, 22, and Los P., 19, are working on degrees related to the music industry from Cuyahoga Community College, getting the tools to succeed they never thought they'd have before. Shirts on display at Fresh Lab in Detroit Shoreway. "I don't know, I'd probably be somewhere I wouldn't want to be," said Los. "Music really did save my life," said Warner. Refresh Collective started in Glenville and expanded around east side communities. For the first time, they're starting a camp this summer in the Clark-Fulton and Detroit Shoreway communities after opening the Fresh Lab nearby.